The people I find hard to buy for are couples, I always try to find something that they will both love or enjoy. I did come up with a few ideas but what do you buy for a couple? 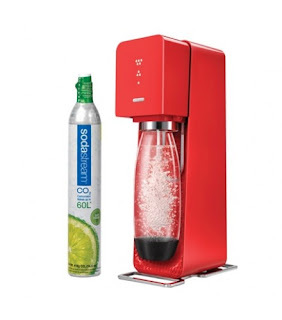 The Sodastream Source is perfect for the couple who love sparkling water, with its sleek attractive design it doesn’t look out of place on the kitchen side. It even has an LED light to indicate how much fizziness is in your water and you can obviously vary this to your own taste. The bottle just slots in and has a snap lock design so there are no spillages. Sodastream Source comes complete with a 60 litre aluminium gas cylinder and a carbonating bottle, this can be exchanged when empty in lots of stores or online for around £9.99. Along with plain sparkling water there are a variety of mixes available to buy and not all of them are high in sugar, there are sugar free syrups and even healthier options for children. I like the fact that it is more environmentally friendly than buying lots of bottles of drinks from the supermarket and it is really good for any gin lovers out there, you will never run out of tonic water again. The Sodastream Source costs £89.99. Now that the Great British Bake Off as finished why not buy some useful things for the kitchen. My son and his girlfriend are setting up home after Christmas and requested a long list of items but they particularly liked this Stainless Steel Mixing Bowl from Oxo, it has a non skid base and can be used for a multitude of tasks such as baking, marinating and chilling and even better it is dishwasher safe. This really is a super sturdy bowl and as my son trained as a chef I am sure he will love it for his collection of bakeware, the price is £14.00. Also on their Christmas lid was a decent tin opener Oxo also have a Magnetic Can Opener with Lid Catch which stops the lid falling in to the can once you have opened it, another great product priced at £15. I always try to find something that little bit special to remember certain years and Getting Personal have some really nice personalised gifts to choose from. 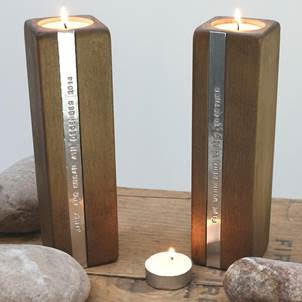 My favourite as to be this gorgeous pair of Personalised Wooden Candle Holders, they are crafted from birch and have a metal strip running down the length of them which can be personalised by hand stamping with your message. I love the feel of these candle holders they are so smooth and the grain of the wood is delightful, each one is shaped, sanded and waxed by hand. In the top you just place your tea light candle and admire, I’m sure you will agree they will make a great keepsake. 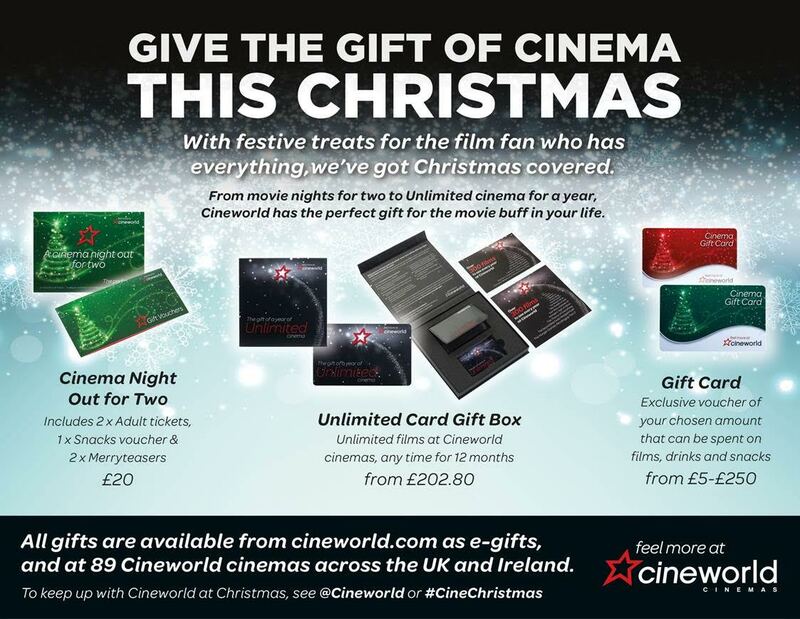 Cineworld are selling a Cinema Night Out for Two, you receive 2 x adult tickets, 1 snack voucher and 2 x Merryteasers for £20. 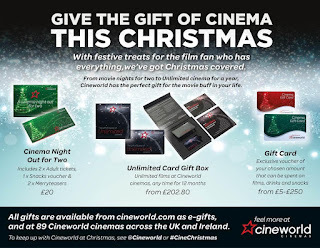 I think this is a really great idea for a couple who are hard to buy for, I know I would love to receive something like this and usually there are some really good movies out at Christmas. Cafedirect offer a handpicked subscription service where you receive a different coffee from the Discovery Collection every month, coffee is sourced from some of the finest small farms across the world and even better the company invests a third of its profits into cooperatives and communities. Along with the coffee you receive a tasting booklet which tells you all about the coffee you have received. You can choose espresso or filter and also whole beans or pre-ground all which comes in a handy sized box that fits through the letterbox. This is an ideal gift for coffee connoisseurs, subscriptions start at £24 for 3 months and go up to £85 for 12 months and the coffee I received was delicious. There is nothing better than sitting down to a nice glass of wine and Dark Horse have now officially launched in the UK offering a Cabernet Sauvignon which is full bodied and rich made from hand-selected grapes from California’s Lodi and Delta wine growing region, this has a lovely earthy flavour and would be perfect with a grilled steak and nice dressing. The Chardonnay is quite sweet but out of the two I do prefer this, may be because I have never really drank a lot of red wine and prefer white, I could definitely drink a bottle of this whilst eating cheese and crackers. Both wines are priced at around £8.99 per bottle and are available from supermarkets. Watch out for my next instalment in gift ideas, would love to know what you would like in your stocking on Christmas morning? I love your candleholders they are perfect for the xmas season and so unusual too. Some great ideas here. I bought a movie night type present last year for my sister (cinema voucher.) Love the fact you can get snack vouchers as well, as didn't know that. I'd love a soda stream. My grandparents used to have one and I loved using it when I was younger, the fizzy drinks always tastes better out of a glass bottle! I love the ideas you have here, and you are so right. It's hard to buy gifts for couples. Wine and chocolates always go down well with my husband and I. At least it is something we will definitely use. I love the candle holders, they are really gorgeous. It can be a bit difficult at times to find things for couples, but I love all of your ideas! Some great ideas here - I think the cinema vouchers and wine would go down best for me! I never know what to buy my husband. A soda stream is a fab idea! I have a Sodastream on my Wish List. I really hope we will buy it some time soon. I tend to do anything that can go in the kitchen, food is a,ways a good gift at Xmas. Spices, oils, or a mini superfood hamper always goes down well. Awesome ideas there! The sodastream, Cineworld and coffee would be perfect for me! Different coffee every month would deffo go down well!